"DVD to DVD" option is the most powerful and flexible DVD copying/burning software. With 8 copy modes, you can backup any DVD to DVDR or hard drive in just one or a few clicks. "File to Mobile" option converts source video file on your PC to next generation console like PS3 and Xbox 360, or mobile devices like iPod, PSP, ZUNE, cell phone, etc. "File Mover" option transfers converted files to mobile devices like iPod, PSP, ZUNE, etc. "DVD to DVD" option is the most powerful and flexible DVD copying/burning software. With 8 copy modes, you can backup any DVD to DVDR or hard drive in just one or a few clicks. "DVD to Mobile" option converts DVD title to AVI/MP4/WMV/MKV files which can be played on mobile devices like iPod, PSP, ZUNE, cell phone, etc. 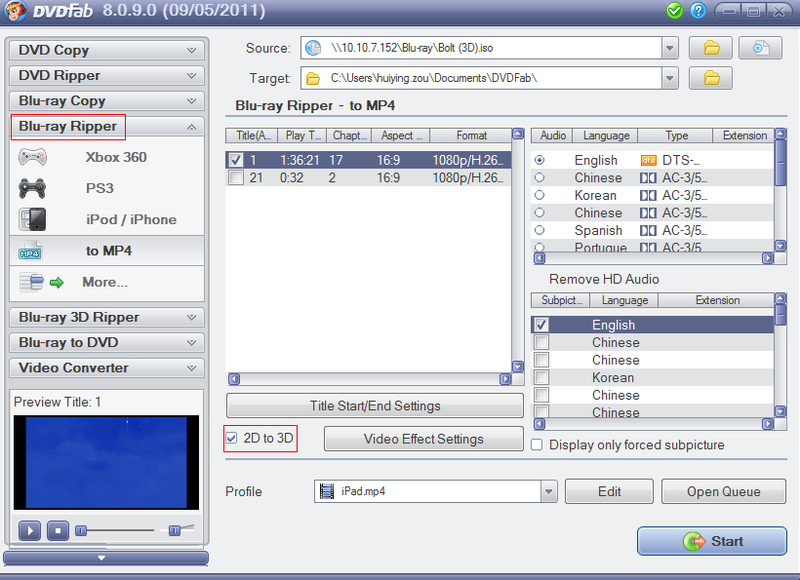 "Blu-ray to Blu-ray" option is the first full-featured Blu-ray copying/burning software. With 4 copy modes, you can backup Blu-ray to BD-R or hard drive in just one or a few clicks. "Blu-ray to Mobile" option converts Blu-ray title to MKV/MP4/AVI/WMV files which can be played on next generation console like PS3 and Xbox 360, or mobile devices like iPod, PSP, ZUNE, cell phone, etc. "File to Mobile" option converts source video file on your PC to next generation console like PS3 and Xbox 360, or mobile devices like iPod, PSP, ZUNE, cell phone, etc. "File Mover" option transfers converted files to mobile devices like iPod, PSP, ZUNE, etc. All DVDFab reviews, submitted ratings and written comments become the sole property of Windows 7 download. You acknowledge that you, not windows7download, are responsible for the contents of your submission. However, windows7download reserves the right to remove or refuse to post any submission for any reason. Windows 7 Download periodically updates pricing and software information of DVDFab full version from the publisher, but some information may be out-of-date. You should confirm all information. Using warez version, crack, warez passwords, patches, serial numbers, registration codes, key generator, pirate key, keymaker or keygen for DVDFab license key is illegal and prevent future development of DVDFab. Download links are directly from our mirrors or publisher's website, DVDFab torrent or shared files from free file sharing and free upload services, including Rapidshare, MegaUpload, YouSendIt, SendSpace, DepositFiles, DivShare, HellShare, HotFile, FileServe or MediaFire, are not used. I'm a new user to dvdfab. I used to use anydvd but switched when anydvd raised their prices. Not only is dvdfab cheaper but it burns faster too and has ipad support so I could convert my videos to ipad format. They also seem to update alot more than anydvd. tarzanmedia.com is the cheapest place that I've found after a long search.